News Prom Parent Committee Needs Your Support - THE TIME TO DONATE & SIGNUP IS NOW! Prom Parent Committee Needs Your Support – THE TIME TO DONATE & SIGNUP IS NOW! 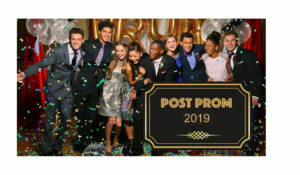 We are looking for donations, chaperones and volunteers from parents of FRESHMAN, SOPHOMORES, JUNIORS & SENIORS to support Post Prom and the Prom Red Carpet Event. This communication will help you understand why we solicit from parents of underclassmen and why your help is needed. Dancing, karaoke and refreshments are provided during the chaperoned, alcohol-free, 5-star cruise. Hinsdale Police and Parent volunteers chaperone. Following, students board busses back to Hinsdale Central, arriving home around 3 a.m.
Chaperones manage Odyssey student check in and walk around to make sure everyone is safely having a great time. Grab some friends and volunteer – it’s a fun sneak peek to Prom! We hope that every Hinsdale Central family will choose to contribute to this safe and fun tradition!